Guest post written by Katherine Forster, Native Flora Program Coordinator, Friends of Petrie Island. Want to get inspired about more natural landscaping? Wondering what native plants you can introduce to support wildlife? Curious about whether wildflowers would look good in an ornamental garden? Then check out a new free event in Ottawa that is a collaboration between four local native plant gardens on the weekend of June 19th to 21st! 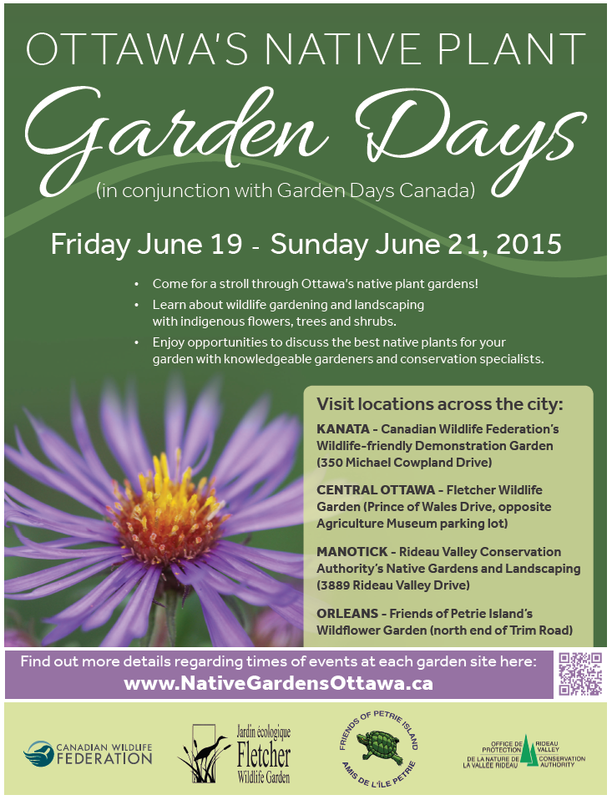 Ottawa’s Native Plant Garden Days offers opportunities to visit the four gardens over the three days, starting on Friday June 19th. Two gardens: the Rideau Valley Conservation Authority’s landscaped gardens in Manotick and Friends of Petrie Island’s wildflower garden in Orleans will be staffed that day so that visitors can ask questions and learn more about natural landscaping and gardening for wildlife. On Saturday, the public is encouraged to visit the gardens for self-guided tours. At each site there will be different resources such as pamphlets, display boards or signed garden beds and/or plants. (Petrie Island will have limited access on the Saturday due to the Carivibe event so there will be no Native Plant Garden Days events held in Orleans on that day.) Many of these resources will be available in French and English. On Sunday, three of the gardens will be staffed: Fletcher Wildlife Garden, the Canadian Wildlife Federation’s Wildlife Friendly Demonstration Garden and the Friends of Petrie Island’s wildflower garden. These four Ottawa gardens provide examples of native plants in different settings, from lovely backyard flower gardens and larger landscaped yards to a more naturalized setting where you will find flowers popping up in fields, smaller natural beds and along walking trails. This is a great opportunity for people to either visit the garden that is closest to their home or to tour all four locations in one day, so that they can enjoy the variety of these Ottawa native plant gardens. And in case someone misses this June event, all four gardens are open during the warmer seasons for the public to visit at any time. For more details on the Native Plant Garden Days event including times and locations, please consult the website: www.nativegardensottawa.ca.